Preserve History, Don't Remove Artifacts – Here in New Hampshire, outdoor recreation is growing at an alarming rate. And there has been a surge of people exploring historical sites in the White Mountains. As a conservation photographer, I am obligated to create awareness for the laws that protect our American heritage. For historic preservation to be successful, it is imperative that we promote the protection of historic sites. 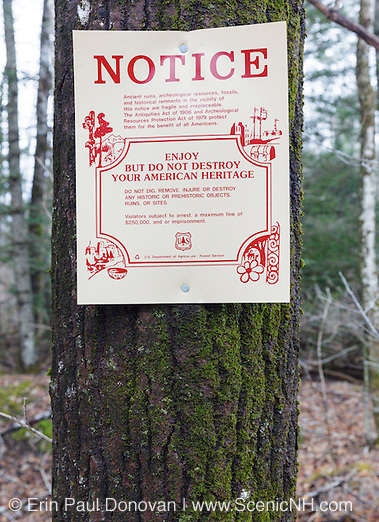 As you explore the abandoned cellar holes, farming communities, logging camps and other historic sites in the White Mountain National Forest, please keep in mind that the removal of historical or archaeological artifacts from federal lands without a permit is a violation of federal law. The destruction of artifacts and historic sites is also a crime. And please remember you can’t dig at historical sites. 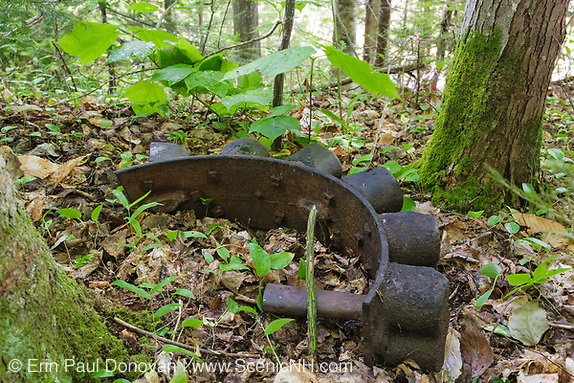 So metal detecting anywhere in the White Mountain National Forest where there could be artifacts is risky business. See the links at the end of this article for the laws that protect these special places. The story of the missing artifact (above). 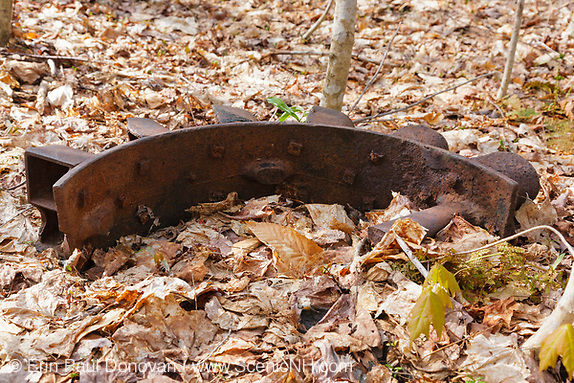 To the best of my knowledge, up until 2011, this artifact was part of the logging Camp 16 site along the old East Branch & Lincoln Railroad in the Pemigewasset Wilderness. In June 2011, while at logging Camp 16, I noticed that it had disappeared from public view. And then in July 2011 it reappeared along the Bondcliff Trail (formerly the Wilderness Trail) about a half of a mile from Camp 16. It seemed a hiker was trying to carry the artifact back to the trailhead. And they were carrying it out as far as they could each time they hiked the trail. The last time I saw this artifact (above), it was on the side of the Bondcliff Trail, near One Mile Brook , but I have not seen it since. It is unknown if a hiker succeeded in removing it from the Pemigewasset Wilderness or if it is just out of public view. Either way, these actions are wrong, and the historic preservation of logging Camp 16 has been permanently disturbed. And a unique artifact of the EB&L Railroad is possibly gone. Most of the bottles, metal objects and railroad related stuff you see in the White Mountains is not junk or litter. They are artifacts, and they should be left where you find them. Help preserve our heritage and leave historical sites in the same condition you find them in. And please, if you know anyone who is removing artifacts from the White Mountains report them to Forest Service. Artifacts help tell the story of the White Mountains region.